Ever since 2013, when "selfie" was declared word of the year by Oxford Dictionaries, smartphone and camera makers have upped their efforts to appeal to those of us who regularly take pictures of ourselves. HTC has always been on the forefront of this wave, offering front-facing cameras with more megapixels and wider angles than the competition. The company's newest smartphone, the HTC Desire Eye, takes it one step further: both the front and rear cameras are 13MP, utilize the same sensor, and have a dual-LED flash. Arriving on AT&T later this month, the Desire Eye has more going for it than two sweet cameras. The slim design is comfortable and sturdy, the big display beautiful and bright. The best part: though it clearly has some premium features, the Desire Eye is destined for budget pricing. Though the cost hasn't been announced yet, it's a good bet that AT&T contract customers will be able to score this phone for $0 down. The Desire Eye's 5.2-inch display pushes the phone toward phabet territory but it doesn't quite get there thanks to a slim body that minimizes bulk around the screen. The casing is plastic yet doesn't feel cheap or bendy. The molding is such that the phone feels much like it's a unibody design even though the colorful band around the edge indicates it's not. The rounded edge and smooth back make it comfortable to hold yet not so slippery that I felt in danger of dropping it when going one-handed. I have larger hands, so it's possible for me to work the phone with one on a limited basis. If you have smaller hands that's a no-go. If you prefer big phones you're used to this by now. The display is bright with deep colors and wide viewing angles--a good canvas for the HTC Sense skin over Android. Sense 5 doesn't mess with the underlying operating system too much, it just adds a bit more efficiency and some visual flair. The front-facing camera is far more noticeable on this model than on most phones since it's the same lens as the one on the back. Apropos to the Desire Eye name, the large lens gives the impression that it's watching you all the time. Maybe not what HTC was going for. Still, you'll appreciate the quality of the photos you can get with this camera. The test selfies I took had minimal noise, correct color, and lots of detail. And the flash helped even out my skin tone without blowing out the bright colors. The rear camera, being the same tech, was just as impressive. Supporting the hardware is a robust camera app that builds on some of the great stuff first found on the HTC One M8. The interface is almost the same, but now there are extra features for the Selfie camera such as auto-detect selfie, voice command, and the ability to take a picture that combines images from the front and rear cameras at once. These features aren't new in the world of smartphone cameras, they're just must-haves for camera-focused phones. These upgraded features are part of HTC's EyeExperience, geared toward people who take a lot of pictures with their phones. 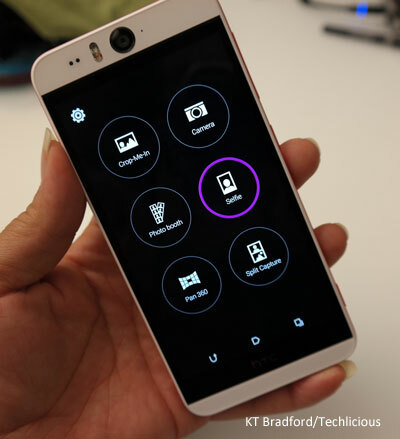 Though debuting on the Desire Eye, these features will be pushed to HTC One phones in an update later this year. The Desire Eye will also launch with the full-fledged Zoe image app which was still in beta when the One M8 debuted. With this app you can easily create short videos from the pictures and vids in your gallery using pre-set themes. Inside, the phone runs on a quad-core CPU with 2GB of RAM for smooth multitasking. It ships with 16GB of internal memory and includes a microSD slot that takes cards up to 128GB. The 2400 mAh battery will likely last all day on normal settings, though we won't know for sure until we test it ourselves. The Desire Eye has three mics built-in for superior quality and noise cancellation during video chats and speakerphone calls. 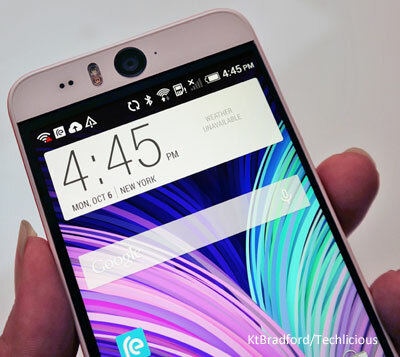 Though the upfront speakers aren't as noticeable, HTC did put BoomSound technology into this phone as well. 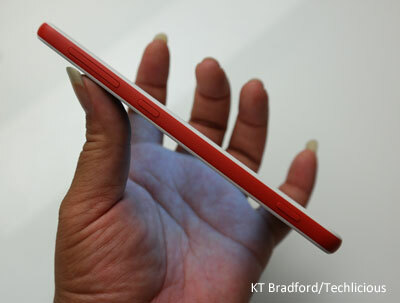 I came away from my short hands-on time with the HTC Desire Eye very impressed. I like the way the phone feels in my hand and how the screen looks. As a selfie addict myself I can't help but appreciate the quality of the front camera and the app experience. Though the price remains a mystery, the fact that HTC has put this much effort into a budget phone is impressive. Hopefully AT&T will keep the price low to make the device attractive to customers at every budget level.